US envoy to Russia Jon Huntsman hopes to take Russian-American ties in a "warm direction"
Moscow: The latest attempt at Russian-American rapprochement came in the guise of a shirtless U.S. ambassador. Wearing black swimming trunks, U.S. 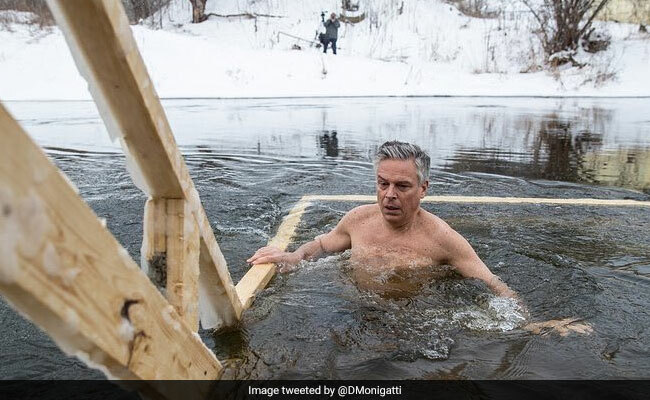 Ambassador Jon Huntsman on Sunday plunged into the icy waters of the Istra River outside Moscow, as Russian journalists' cameras rolled. The former Utah governor was trying out an Orthodox tradition for the Epiphany holiday, commemorating the baptism of Jesus in the Jordan River. His frigid dip had a geopolitical air to it: Huntsman was following Russian President Vladimir Putin, who did his own shirtless Epiphany photo op on Friday. "This allows us to better get to know Russia's great culture from the inside," Huntsman told a Russian television reporter afterward, according to the TV translation of his remarks. Huntsman, the reporter added, "is confident that this cold tradition can help move Russian-American relations in a warm direction." Thus the United States got a moment of good press at a time when the looming congressional sanctions seem set to drive U.S.-Russian relations to new lows. A photograph of the shirtless Huntsman emerging from the river led the website of the popular tabloid Komsomolskaya Pravda. TV channel 360 said the ambassador showed "Russian courage and English gallantry." Huntsman's courage did not, however, seem to make much of an impression on one of the Kremlin's main propagandists, television host Dmitry Kiselyov. His weekly show Sunday night featured a segment slamming The Washington Post for "fake news" on Russia's role in the U.S. election; another on an unkept U.S. promise not to expand NATO to the east; and a third claiming American athletes were getting away with doping. U.S. diplomacy, Kiselyov told viewers, is "dishonest - even treacherous."